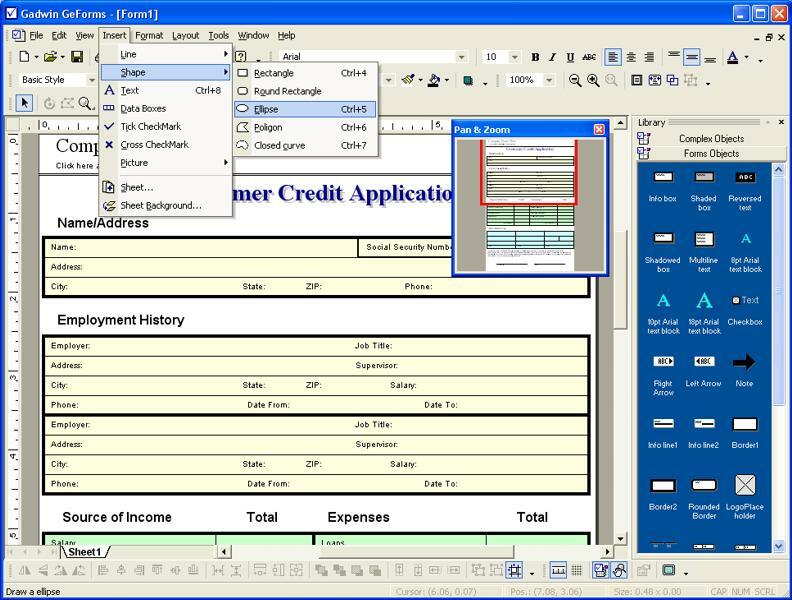 Gadwin GeForms is powerful software that can be used for creating a variety of personalized office stationeries and electronic forms. GeForms™ is the ideal program for creating a wide variety of customized invoices, purchase orders, customer satisfaction reports, attendance records, and whatever else you require. Although many companies and organizations now distribute their forms in portable digital format (PDF) for printing, there's no means of opening those files in a word processor. There is a solution, however. If you have a scanner, you can scan the form as an image, and then use that image in a GeForms™ as sheet background. You've got an electronic form that you can fill out right on your computer screen. Powerful drawing tools, such as Line, Curve, Rectangle, Polygon, Ellipse, etc. Many lines styles, curves patterns, and designs. Create your own styles like a word processor. Allows change of character spacing and line spacing in text. Full zoom and Pan capability. Copy or export forms to any program that supports OLE. Import graphics and clip-art to use in your forms. Drag and drop object from Object Library.